Today we had gusty winds and a few heavy showers. The winds were from the north-east at 15-25 mph and the temperatures were in the mid 80’s. Up on the Avon beaches bluefish and sea mullet were reported. Around the Buxton beaches sea mullet and bluefish were caught. Over on the Frisco and Hatteras beach citation sea mullet and pompano and bluefish were caught early this morning before the weather arrived. The inshore boats had catches of bluefish and puppy drum in the Pamlico Sound today. The offshore boats caught a few Dolphin, some wahoo and a blue marlin, 3 white marlin and 2 sailfish released. Today was the final day of the 14th Annual Hatteras Grand Slam Tournament. There were 4 blue marlin, 6 white marlin and 7 sailfish released. Predator won the Grand Slam Jackpot with a Blue, White and a Sail released today. Pictured is Bankwalker’s blue marlin 495.5 lb. 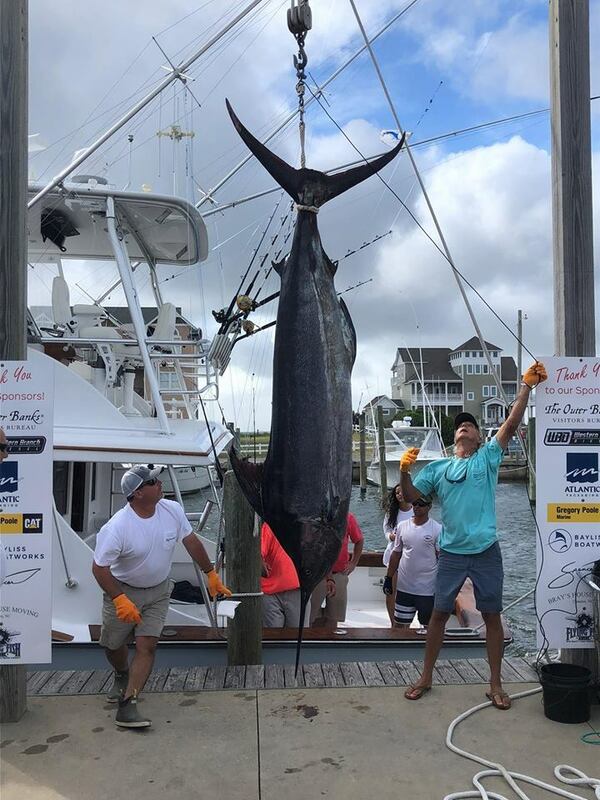 This entry was posted in Cape Hatteras Weather, Featured Products, Frisco Market, Local News, Uncategorized, What's Biting and tagged 14th Annual Hatteras Grand Slam Billfish Tournament, blue marlin, bluefish, Cape Hatteras, huk clothing, pompano, sailfish, Salt water fishing, sea mullet, white marlin, yeti by frgstaff. Bookmark the permalink.